It’s a little bit difficult to classify Kilo Kish, and that’s a big part of her appeal. On paper she falls somewhere in the spectrum between R&B and pop, able to crack wise and have a little fun with some upbeat tracks just as easily as she can slow things down and offer sincere and honest reflections about the social media addicted world around her. Her 2016 debut album Reflections in Real Time explored plenty of stylistic hats, and went a long way towards proving she’s got a wealth of talent that’s waiting to be explored further. Expect a high quality and fascinating performance with impressive vocals, good energy, a little bit of dancing and maybe even a prop or two. Sometimes you’ll be reminded of the experimental art pop of FKA twigs and Frank Ocean, while other times you’ll be ready to party in the style of Shamir or Gorillaz. It’s probably worth showing up early to check her out, is what I’m saying. Those looking for a sequel to last year’s Sunday jazz brunch with Sun Ra Arkestra at Pitchfork might be a little disappointed with the options for 2017. The closest you’ll get to recreating that magic comes courtesy of saxophonist Colin Stetson, who’s sonic explorations have the potential to blow minds and confound in equal measure. The man uses and plays a saxophone in a very different way than you might expect, particularly because the noises he makes are non-traditional and challenging to describe. Basically it feels like he puts his entire body into the instrument, using breath management and varying key pressure to manipulate the tones in innovative and occasionally terrifying ways. There may be some distortion pedals involved as well, I can’t say for sure. If you like experimental jazz and can handle the occasional drone or dirge, Stetson will be one you absolutely do not want to miss. Chicago’s own NE-HI have grown a tremendous amount in the last couple of years, really expanding their sound into new corners beyond Wire-esque post-punk while also giving new focus to their songwriting. Their new record Offers arrived earlier this year, and was packed with dynamic hooks and enough energy to power an entire city. It was primarily recorded live in the studio to help capture the band’s playfulness and intensity. Of course nothing quite beats a NE-HI live show, because that’s where their songs get transformed into these hulking behemoths that rattle your body in the best sort of way. They remind me a lot of fellow Chicago band Twin Peaks, but cross-bred with Parquet Courts, The Velvet Underground and Real Estate. If you’ve arrived at Union Park in time to catch all or at least some of their set, I’d say show them some local love. The thing about local love though is that there’s only so much to go around. See, another talented Chicagoan’s set time crosses over with NE-HI’s, and that’s legendary DJ and producer Derrick Carter. He’s one of the finest and most popular proprietors of underground house music in the world, though a majority of Chicago locals have no idea who he is. Maybe his set at Pitchfork will change that a little bit by pushing all of those fickle and notoriously closed-off indie snobs to dance a little bit. With over 25 years of industry experience to pull from, Carter knows how to get a crowd pumped and throw a real party. Sunday afternoon isn’t gonna know what hit it, so dust yourself off and make a tough choice between beats and guitars. There is no wrong answer, by the way. When Isaiah Rashad performed at the Pitchfork Music Festival back in 2014, he was still sort of a new kid on the block, and stood out from a lot of other rappers by openly and honestly confronting his emotions throughout his debut album Cilvia Demo. In the years since, he fell hard into addiction and depression before getting help and finding his way again. That dark odyssey was chronicled on his 2016 album The Sun’s Tirade, which once again benefited from the confrontational and confessional nature of his lyrics. Despite all the self-loathing and lessons learned, Rashad has never sounded so confident and comfortable in his own skin. And subject matter aside, he’s immensely creative and unique in how he raps, stretching or stressing certain words that might normally go ignored, or even changing the octave of his voice to get a point across. 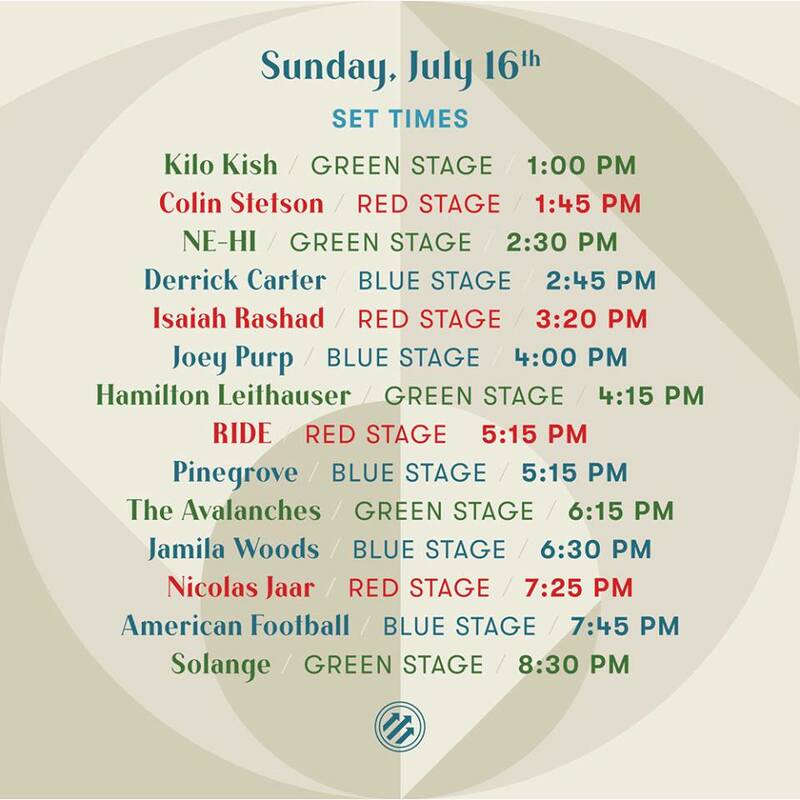 Outside of ten minute windows at the start and finish of his set, there will be 30 minutes of uncontested Isaiah Rashad to enjoy in the middle of a Sunday afternoon. So strap yourself in or go grab a drink if you don’t like good music. It’s going to be a great transition from Isaiah Rashad’s very personal and honest hip hop to Joey Purp’s very impersonal but still honest hip hop. The tracks on Purp’s first two mixtapes classify him as something of an outside observer of the world around him and the Chicago community he lives in. There are tales about murders and drug deals and women and wild parties, all of which ring true and probably are true. But he likes to shift perspectives a lot onto friends and family and strangers, as well as give multiple sides to a single story. Everything he does and raps about provides insight into his own approach to living in this world, trying to survive and find success on his own terms. It’s great stuff, and manages to be high energy and fun at the same time. You can’t quite say the same about Hamilton Leithauser. The former frontman for The Walkmen released an album last year in collaboration with former Vampire Weekender Rostam Batmanglij. It was a great record packed with a variety of songs and styles, sort of like they’re trying on different sets of clothes. So you’ll get a baroque pop song leading into an alt-country song leading into a bit of orchestral folk leading into a touch of doo-wop and so on and so forth. This tour through musical history works remarkably well and allows Leithauser to showcase more of his range, particularly vocally. My singular complaint has to do with context. A majority of these songs probably don’t play that well on a sunny Sunday afternoon, unless of course you’re content to take a break and relax for a bit in the shade. What’s always amazed me about the shoegaze genre of music is how loosely defined it can be. For example, both Ride and My Bloody Valentine are considered peers with similar sounds, but I struggle to find a lot of common ground between them. The general speed and clarity of most Ride songs is high, while MBV is low. The loud and abrasive guitars are the same though, and I guess that’s all that matters in the end. But enough with the comparisons, let’s discuss how Ride are legends in their own right. Their 1990 debut album Nowhere is an unimpeachable rock masterpiece no matter what sub-genre you try to affix to it. Their follow-up Going Blank Again also managed to become an instant classic before things took a turn for the worse. They broke up in 1996 and stayed away for nearly 20 years, which was enough time for everybody to start feeling nostalgic. Perhaps inspired by MBV’s return in 2013, Ride soon followed suit and earlier this year released Weather Diaries. It’s a halfway decent album, managing to recapture some of that old magic while also attempting to add a few modern flourishes that maybe weren’t such a good idea. All that said, many people, including myself, will be seeing Ride perform for the very first time. Ideally as long-time veteran musicians they should sound great. Whether or not their set will be worthwhile probably depends on what they play. If it’s at least half classics I’ll be satisfied. New Jersey’s Pinegrove makes music that’s best described as alt-country for the pop-punk/emo crowd. Their debut album Cardinal was one of 2016’s biggest and best surprises. Laid back and introspective, it’s reminiscent of bands like Wilco, Bright Eyes and Rilo Kiley but with a touch more life-and-death passion behind it. Hopefully that leads to a vital and hungry set from the band as they fight to win over new fans. An Avalanches performance is rare. An Avalanches performance in Chicago is ultra-rare, because it’s never happened until now. The Australian electronica group has been around for 20 years, but fell dormant for most of that time. It took them 16 years to craft a follow-up to their essential 2000 debut Since I Left You, the process delayed by a large number of factors, the most paramount among them being sample clearance. But as anybody who’s paid close enough attention and actually studied one of their albums will tell you, those samples are the most important part of their unique aesthetic. When Wildflower finally came out last summer, it might not have had the same impact as their debut, but it was no less impressive in execution. These sonic collages seem to blend together effortlessly, like foods you never thought to put together but wind up tasting incredible. I’m not sure what an Avalanches live show will entail, but even if it’s just a couple guys behind a table pushing buttons, being able to experience these tracks with a large festival crowd should create a fun dance party to start winding down the weekend. While Chicago’s own Jamila Woods’ songs might not have the propulsive and strange energy that The Avalanches’ do, her form of socially conscious R&B has plenty of unique creativity on its own. Her debut solo album HEAVN earned her a lot of attention last summer for its ability to take rather playful and almost child-like sounds/themes (hand claps, snaps, xylophones, lullabies) and layer them with exceptionally smooth vocals singing about some extremely important topics. Some might call it “woke” R&B, where Woods never outwardly expresses anger and tries to accentuate the positive while still managing to get lots of important points across about living as a person of color in today’s America. It got her signed to Jagjaguwar, who will re-release the album later this year. Woods has really made a name for herself, and earned some powerful friends such as Chance the Rapper, Kweku Collins and Peter Cottontale along the way. Her Pitchfork Fest should be lovely and inspiring, and I’d recommend you drop by, even if it’s only for a song or two. What’s fascinating to me about Nicolas Jaar is that he’s been making experimental electronica for at least seven or eight years now, has put out multiple critically acclaimed albums, but yet the thing that got him the most attention was a team-up with guitarist Dave Harrington to form Darkside. As a duo, they only put out one album in 2013 before taking an “indefinite hiatus”. You’d think they’d want to continue in a similar fashion to Run the Jewels, where Killer Mike and El-P make the absolute most of their collaboration because it’s marked the biggest successes of both their careers. But Jaar is apparently content to follow his own path, and that means more sonic experiments with journeys into the meditative and unknown. There are always beats, but don’t expect tempos to be high or easy to dance to. I mean, you can dance to it most of the time, just in a very measured and calm way. Far more captivating is how he manages to blend a variety of sounds into what often seems like an entirely improvised performance. He does a lot of sonic manipulation and looping, but also has a full band with him to play instruments and add percussion in real time as needed. You’re never fully sure where it’ll head next, but it’s almost guaranteed to be smooth and maybe even a little jazzy. It’s electronica for thinkers, and that should get you excited. As for American Football, the Champaign, IL band first made a name for themselves in the late ’90s by helping to establish the Midwestern emo sound alongside other bands like The Promise Ring and Braid. They only put out a single self-titled album in 1999 before calling it quits, and it is very much a punk rock and emo masterpiece. The members went on to form a variety of other bands, each achieving various degrees of success, before finally reviving American Football a couple years back. That resulted in their (also very good) second self-titled album, which came out last fall after a 17-year hiatus. It’s almost ironic that American Football would return just when there’s a bit of nostalgia happening right now for ’90s emo. But as Mike Kinsella will tell you, there was never much intention for American Football to be a long-lasting band that achieved lots of popularity. I guess their primary goal is still to just have some fun and enjoy making music together for however short or long that may be this time around. Their live shows are loud, high energy affairs, as one might expect, so if you’re looking to expend some of your last bits of energy into the weekend this would be where to do it. On the other hand, maybe you’ll just want a good cry because you’re tired and the weekend is coming to an end. American Football can help with that too. Closing out a weekend of music festivalgoing with a set from Solange just feels right. Her last performance in Chicago was, ironically enough, at the 2013 Pitchfork Music Festival. Of course at that time she wasn’t quite at headliner status, performing an early evening set instead, which I described thusly: “Pretty much everyone that showed up to watch her set was looking to have a fun time and dance a bit, and on those things she delivered in spades.” Four years later, what still sticks out in my mind is how joyous the entire thing was, just radiating out of control with positive energy. Based on what I’ve seen from her more recent performances, Solange has toned down that side a bit in favor of a more socially conscious and heartfelt approach. That certainly fits better with a lot of the music on last year’s masterpiece A Seat at the Table, which offered a lot of social and personal commentary while still seeking to inspire. Brilliant as the album is, there aren’t exactly a lot of big pop hits on it. That’s probably more the job of her sister Beyonce at this point in time. But just because she’s been less focused on big choruses and uptempo tracks doesn’t mean her music is any less important or powerful. And besides, she’s got plenty of that mainstream pop/R&B material throughout her back catalog to pull from. So I’d say expect a fair amount of artful posturing blended effortlessly with a bunch of lighter, more festival friendly material. It certainly can’t be more obtuse than last year’s festival-closing set from FKA twigs, which I loved but left plenty of others feeling confused or chatty. Solange has got this, so let’s trust in the Knowles name, yeah?